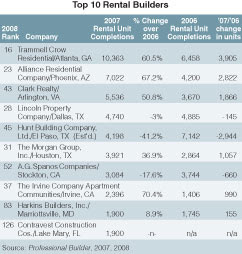 Six of the 10 rental kingpins finished more units in 2007 than in 2006, while the single-family builders are all down. Markstein predicts another upswing in luxury renters-by-choice in many markets. "Since home appreciation rates are likely to be flat for several years to come, there's not as much motivation for young, high-income couples to buy," he says. Such couples may opt for well-located rental apartments and put off owning a home until prices really start to recover.